I find that the best and most interesting photos are ones with people in them. But sometimes it's hard to take a picture of a stranger. Unless they happen to be asleep. I am counting the days. Weeks. OK, months until I visit my friends Simon and David. And one of the things I most like to do when I'm there is to walk through David's garden. So many plants, so different from those I'm surrounded by in New England. Like these, still thriving in November. Equal rights at work here in Quebec. The Blue Mosque. Probably the most-visited mosque in Istanbul, if not the world. There is a protocol that is strictly observed (removing shoes, maintaining silence, etc.) and that mosque officials have down to a science, which allows the thousands of visitors to file through systematically and in a relatively orderly manner each day. The crowds inside are daunting and inescapable. Unless you look up. For those of us of a certain age, it's almost impossible not to have some emotional reaction to memories of the Vietnam War. (I had won the era's draft lottery -- my birthday had come up #16 -- and I was summoned for my physical. Which I failed. A long story.) Earlier this month, 'The Wall that Heals,' a Vietnam Veterans traveling memorial came to Gloucester and I went to see it just as it was opening to the public one Saturday morning. Of course, I got teary. And so did another early visitor, a big, butch Vietnam veteran who seemed mighty uncomfortable letting people see him cry. The Veterans Aid volunteers approached him gingerly, and it was touching to hear them ask, "Are you OK, buddy? Can I help you out? Want to take a walk?" The eye craves symmetry. Even if it's just to violate it. Even if it's in a series of windows and fire escapes on a brick apartment building in lower Manhattan. Now if we could just do something about the placement of those air conditioners. Andy Warhol famously once said that people would rather look at something than at nothing. Perhaps that's one reason that the developers of the Waterwalk (along the Upper and Lower Bays separating Manhattan, Staten Island and Brooklyn) included a few informational displays to show what creatures live in the waters below. Like this one. 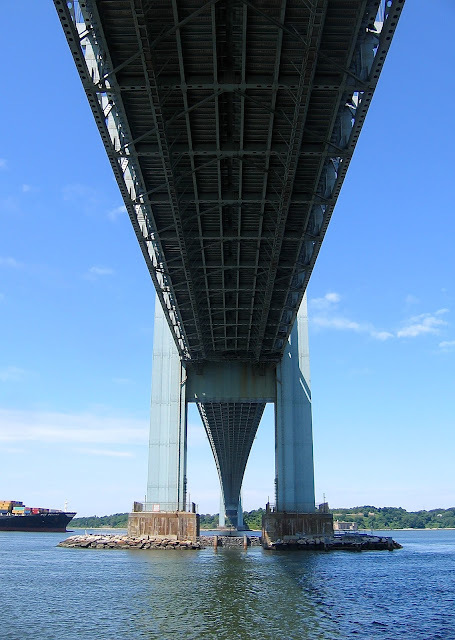 When I was visiting my friend Nick at his new home in Brooklyn, I spent a few mornings walking along the water near (and under) the Verrazano Bridge. On the same trip, I heard a woman talking about how drunk-driving arrests are much stricter these days than they were when she was a young drinker. She said she'd be partying with friends in Staten Island and when she'd head home to Brooklyn, she'd be so looped that she couldn't maneuver her car through the bridge's toll booths. Today, she'd be apprehended. Back then, the toll booth attendants would emerge to guide her so she could manage to make it through and continue on her way home. Times have changed. And, mercifully, so has she. Too many people talk about "branding" today. Every company isn't a company anymore, it's a brand. Please. Still, there are certain names that conjure up luxurious and nostalgic associations. Cunard is one, don't you think? And, to a lesser extent, Cipriani may be another. Neon sign. Rainbow flags. Beer endorsement. Pride sign. Big picture window onto Christopher Street. Hmmm. That's not the way I remember the Stonewall when I used to go there with my friend Nick back before the 1969 riots. It was thrilling and dangerous and creepy then. Clearly mob-run. On more than a few occasions, all of the overhead lights would come on, the bartenders would take the cash trays out of the registers and quickly scoot out the back door. Then the cops would come in just to intimidate, to check to see if men were dancing with each other...as Nick and I nonchalantly (right!) made for the front door, hoping we'd be able to just walk away. Dancing? To give you an idea of what that was like, even now when we pass the place, Nick will remind me of something I always said on our way in: "Hold my glasses." When the town's handsome tree warden showed up last Tuesday, he deemed the dying Norway maple in front of my house as "dangerous," said that a crew would come to remove it in about a month, that they would put out traffic cones and "no parking" signs the day before. They showed up two days later (surprise!) at 9am, no cones, no signs. (I'm not complaining. I've been waiting for this work to be done since I filed my first request more than a year ago.) These guys were terrific. They told me what they were going to do, they did it, they told me what will happen next. And they were extra-cautious about my cable and power lines. And now, with the help of gardening neighbors, I can start thinking about what full-sun plants might replace the shade plants I've had under this tree for years. When I taught high school for seven years back in the 1970s, To Kill a Mockingbird was always required reading. Consequently I've read it and taught it many, many times. I also remember reading it as a grammar school student when it first came out in paperback. (A friend had loaned it to my mother, who had passed it on to me.) I've read it for pleasure several times since and loved Sissy Spacek's masterful reading of it as an audiobook. So I was somewhat apprehensive when I learned that Harper Lee (or her caregivers) decided to publish its sequel, Go Set a Watchman, written before Mockingbird but set some 20 years after the events in that classic novel of racial inequality in a small Southern town. I've now read it, and here's what I have to say. It provoked the same fine feeling in me that The Godfather, Part III did when I first saw it: It didn't live up to its predecessor, but it was wonderfully thrilling to be reunited with characters I loved and to learn what they'd been up to. My favorite flower, the hydrangea. To quote Katharine Hepburn (speaking about calla lilies) in the film Stage Door: "I carried them on my wedding day." And this time of year, my yard and I are blessed with at least three colors of them, as seen here. I love visiting the Turkish and Arab stores in my friend Nick's Brooklyn neighborhood. 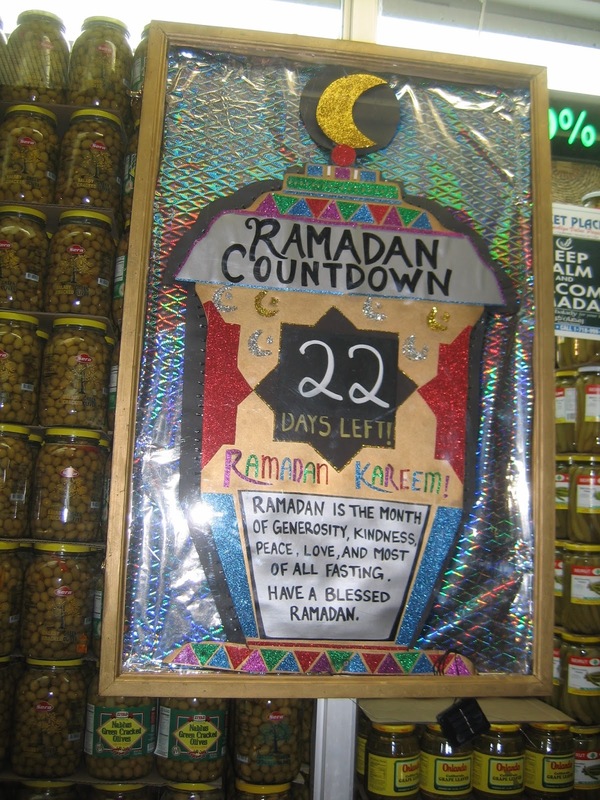 My most recent trip was during the Islamic holy month of Ramadan (which ends today, July 17.) During this time, observant Muslims fast from sunup to sundown. And they break their fast, either at home or in restaurants, with a meal called iftar. We were at our favorite Turkish restaurant, Hazar, on the night pictured. When we arrived at 7:15pm, there were plenty of tables available. But by the time we left, after sundown, the place was packed with hungry diners who had fasted all day. This is the window of the nearby grocery store, Balady, home of countless products you won't find at A&P, Stop & Shop or Foodtown. My beloved friend Simon and I, posed (and I do mean posed) on land that Jay and I later owned. And then didn't. I've just booked another trip to see Simon and David (who took this photo) for Tucson's magical All Souls Procession in November. Visiting these good and welcoming friends is always a real treat for me: Both are artists, thinkers, kind souls themselves. So there are always beautiful things to look at, thoughtful conversations, terrific meals and plenty of coffee always available. Who could ask for anything more? The Verrazano Bridge connects Brooklyn and Staten Island and is beautiful to behold. It reminds me of the Golden Gate, a bridge that features prominently in my sobriety and one that always makes me teary when I see it or, better, run across it. 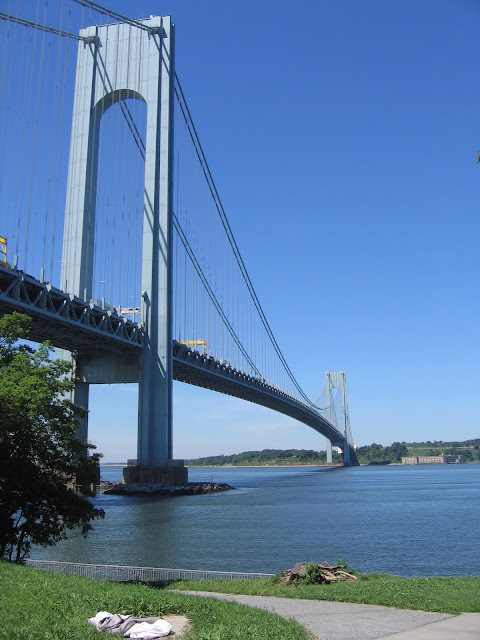 On my recent visit to my friend Nick in Brooklyn, I walked down to the water path that extends under the Verrazano, a path enjoyed by neighborhood residents aplenty: runners, bikers, people just looking for a bench in the shade to watch the boats (and the world) go by. I recently gave a bouquet of white hydrangea from my garden to my friend Zsa Zsa (not her real name), and she told me the next day that her daughter had asked, "Did you steal those?" Excuse me. Then I remembered that Zsa Zsa has a habit of sneaking flowers out of discarded arrangements in cemeteries, searching to see what plants The Home Depot is about to discard, etc. I thought about this, um, activity today when I looked at this photo of flowers I'd had in my dining room last month. The roses and green hydrangea are from my garden. The calla lilies? I confess that I found them on the sidewalk behind the Greek church in my neighborhood, perhaps some blooms that had fallen before or after a funeral or wedding. Sue me. My Jersey City-based friend Kent regularly posts updates on this structure being built above the new transportation hub near 9-11's Ground Zero. He captions each of his progressive photos: Calatrava today. So how could I not visit the site during my recent visit to Manhattan? (I had mentioned to my friend Nick that I liked Calatrava, and he said, "You're the only person in New York who does.") I still like him and his work, even though I keep thinking of how tricky it is to eat a skate wing in a French bistro as I look at his soaring talons. Many, many years ago, my friend Ernest (a faithful international follower of this blog) and I saw a hand-lettered sign that said, "No Strollers. PLEASE!!!" We still laugh about it. So when I saw this sign in Manhattan recently, I thought of Ernest and took out my camera. Looks like they, too, are willing to be polite...up to a point. I've written here before about how much I love my friend Roberto's Fonda restaurants. The original one is in Park Slope, Brooklyn. The second in Manhattan's East Village. And now there's a new one in Chelsea, which it was my good fortune to visit for the first time on a recent trip. Same magnificent food (I had carnitas.) Same cool vibe. And, since word spreads fast, same crowded scene. Here's a look at the guacamole bar with an order of the award-winning guac about to be served. Two years ago today, the man I love and I were married. The ceremony (we asked the Justice of the Peace for the shortest available that was still legal) lasted about 35 seconds and was performed in our home by a man named Mr. Whynott. Seriously. Also on that day, in Manhattan, our friends Roberto and Marco were married. (I take great pleasure each time Marco asks me what's the date of his wedding. It's an easy question for me to answer.) All best wishes to Roberto and Marco and to all the other Americans who are now able to marry the people they love, too. My friend Nick, who grew up with a garden in his Newark backyard, loves to get his hands in the dirt and grow things. So I'm thrilled for him that now, after decades of living in Manhattan, he's recently moved to a Brooklyn apartment with, yes, a garden! Here it is, a work in progress when I visited. When I showed this photo to Nick, he reminded me that since I took the picture, he's added several wax bean plants, some cornichons, some haricots verts, some arugula, etc. There is no stopping him. I grew up in New Jersey and spent a great deal of my teenage and college years in Manhattan. I know my way around. And yet...even now when I visit, it's awfully hard not to look up, just like all the other tourists around me are doing. Here's one skyward view from down in the financial district. One of the many things I love about Morocco is that you'll be walking along, past countless buildings that are sandstone- or terra cotta- colored, and then something shocking like this appears. It's one of the things I love about the Southwest USA, too. Alas, somehow it doesn't work where I live in New England. I never called it "gay marriage." I called it "marriage equality." And now that the Supremes have ruled that the right to marry applies to everyone equally, can we simply call it "marriage"? Thank you. Now available to all Americans, from sea to shining sea. Happy Independence Day. A house across the street from me was sold months ago and has remained dark and vacant for weeks. Until tonight. Walking home after dark, I saw that it had turned into a beacon, every room in the empty house fully illuminated and shining bright. It was thrilling and spooky and, well, see for yourself. I love the red-lettered shorthand this businessman used to instill confidence. Would you trust them?